This online genetics course will take a unified approach to transmission genetics, molecular genetics, cytogenetics, evolutionary genetics, molecular medicine, and developmental genetics. Students will learn from examples drawn from the scientific literature, which stress modern technological and experimental methodologies used in studying the genetics and genomics of prokaryotes, higher plants, and animals. Topic presentations will also reflect that genetic mechanisms play a fundamental role in the pathogenesis, treatment of diseases, and the maintenance of health. All course assessments will seek to emphasize important concepts. Click here for the online genetics course syllabus. The online genetics course will be lecture and lab only. There is no option to take this class as lecture-only. Articulate the relationship between genetic, physical, and cytogenetic maps. Working at the pace typical for a four semester hour course, the average student will complete the online course in approximately 16 weeks. Many students are nontraditional students who have elected an online course for the sake of flexibility. Since the course is self-paced, you may complete the course in fewer than 16 weeks. Recommended: Inorganic Chemistry or a good understanding of atoms, elements, chemical reactions and bond types, acid/base chemistry, and biological macromolecules. 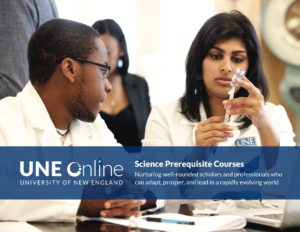 All of the science prerequisites offered at UNE are based online. In order for you as a student to have the best experience possible, UNE has established some technical specifications for you. Click here for technical requirements. It is recommended that students utilize CONNECT from McGraw-Hill to go through the course material with Learnsmart. This is a very good self-assessment tool. The access code comes bundled with the textbook if purchased from our bookstore or CONNECT may be purchased separately.